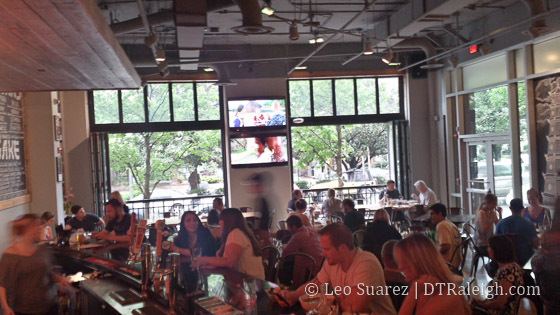 Spring has been quiet, relatively anyway, in the downtown Raleigh restaurant scene. Lots of new places are working hard to open up and the ones that have open are offering something unique that we haven’t had before. In Glenwood South, the Raleigh Beer Garden looks close. You can follow the progress on their Facebook page. They keep saying that they will be open in the Spring. Pho Pho Pho, pictured above, is now open in the former Oryx space in the 510 Glenwood Building. Also in 510, here is a good blog post from the Raleigh DLA blog about the upcoming Italian restaurant, Big Boom. The building at 606 Glenwood that used to have the club named after it’s address is now a new club called Alchemy. Death and Taxes has had a packed house recently as the place is hosting some pop-up dinners through the end of this week. Maybe full opening soon?? The Level Up Kitchen and Barcadium is now open on Salisbury Street. 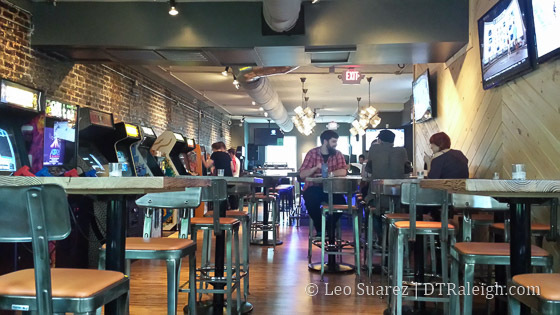 They have a mix of classic arcade games and a great selection of drinks and foods. I’m still keeping an eye out for major updates on Whiskey Kitchen. You can see some very cool murals that were done out front on their Facebook page. A few weeks ago, I posted a photo on Twitter of the future site of Taverna Agora on Hillsborough Street. Standard Foods, located over in Person Street Plaza, is….???? A new bar named William and Company has opened next to PieBird. Circa 1888 has opened at the end of West Davie Street. The new spot has a big patio outside and pool tables inside. On Wilmington Street above Centro, you’ll find Gallo Pelón Mezcaleria, downtown’s (the Triangle’s?) first mezcal bar. Is the West at North tower getting a boutique market and brewery? Twitter seems to think so. An ice cream shop called Treat wants to open in May in City Market. It will be located along Blount, in those shops facing the Skyhouse Apartments. And finally, inside the Skyhouse Apartment building a restaurant called Provenance is planned. You can sign up for updates on their website or follow them on the Facebooks and Twitters. jist stopped by treat this weekend. They are featuring mapleview farms ice cream. They had 22 flavors. Cones, cups, and a few creative sundaes.